The holidays actually went extremely quickly. Week one I had to work for most of it, so Ryley's time was divided between holiday program, hanging out with Marion and hanging out with Dad. 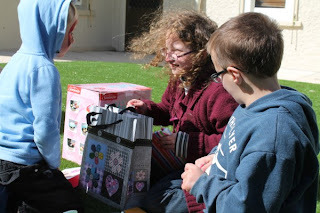 On Friday we headed over to Angaston (Barossa Valley) for Rachael's 18th birthday. We are so lucky to have been able to share such a wonderful birthday milestone. Ryley and Rachael have an incredible friendship which is just amazing to watch. Rachael understands Ryley in a way no one else can. Whenever Ryley is around Rachael, he just becomes this happy, contented and confident kid. It is hard to explain the connection those two have. You really have to see it for yourself. The second week involved more holiday program, mucking around with cousins and hanging out at the farm. So all in all, a busy fun time. I can't believe we are now in term 4 and christmas holidays are just around the corner. And, not long until I have 2 kids at school! Braeden starts his school transition in a couple of weeks. Hard to believe really. I'm so glad you guys had a great holiday. I can't believe it is already term 4 either - and how on earth is Braeden old enough to be starting school??? awwwww happy tears....about the bond Ryley & Rach share. I hope you managed some rest for yourself too Miss! These types of connections are made in the world of spirit and source and that's why they endure and inspire...to be treasured! Where oh where am I?